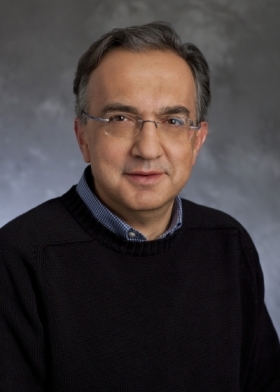 Fiat CEO Sergio Marchionne: "[Europe] is the biggest drain on our resources both in terms of earnings and in terms of commitment going forward." The European downturn has reversed Fiat-Chrysler CEO Sergio Marchionne's priorities. Instead of trying to get enough cash together for a full takeover of Chrysler Group, Marchionne must use the company's money to fix Fiat's European operations, which aren't expected to reach breakeven until 2015 at the earliest. Marchionne has high expectations for the Jeep brand, which he wants to make a global powerhouse. He is worried that European automakers will face massive challenges unless there is an EU-driven reduction in carmaking capacity. The 60-year-old executive discussed these issues and more during an interview at his Turin office with Automotive News Europe Editor-in-Chief Luca Ciferri. Will Europe's recession cause a global downturn next year? No. I think there's a vested interest from global economies to make sure that it does not happen. If you look at the level of interface between the other economic powers and the EU over the last two years, you realize that this issue is being looked at. The other countries will certainly be prepared to help in the event that there's any derailment in the European project, but it's highly unlikely that the project itself will derail. Your call for an EU-backed plan to reduce auto production overcapacity was not supported. Now the countries and automakers must tackle this problem on their own. What are the risks? The risk is that there will be state interventions to protect national entities, which will not necessarily benefit the European market. The fundamental underpinning of the European Union is the creation of a single market. If you allow state intervention to effectively reduce competition by providing subventions, then you've got a big issue. MAIN CHALLENGES: Get Fiat's money-losing European operations to breakeven by 2015-2016; revive struggling Alfa Romeo; make Jeep a global brand with 1-million-plus sales; gain traction in China. CAREER HIGHLIGHTS: Former CEO of chemical companies Algroup and Lonza and inspection specialist SGS Group. Joined Fiat S.p.A.'s board as an independent director in 2003. He was named Fiat CEO in 2004 and became Chrysler CEO in 2009. In 2011, he added Chrysler chairman title and became chairman of Fiat Industrial heavy vehicles unit. Is France's rescue of PSA/Peugeot-Citroen's car-loans arm an example such an issue? I think there are rules in place to try and gauge whether a government bailout is fair or unfair because there's no doubt that the pricing of the guarantee has to be borne by PSA. It's a relatively expensive guarantee and the impact on PSA 's financials should be visible. It's a big issue, so we're all waiting for a determination by the EU as to whether the intervention was fair and within the rules. This year you want Fiat-Chrysler to boost sales to about 4.2 million vehicles from 4 million last year. What will the split be? Chrysler will sell 2.4 million, the rest is Fiat. We should be slightly north of 4.3 million, with a minimum of 2.6 million from Chrysler. It depends a lot on what happens in Europe. Is your plan to merge Fiat-Chrysler into a single legal entity by 2014 still on track? I think it's on track to get it done. It's an inevitable move. I think having a non-controlled entity within the fold of the Fiat-Chrysler world doesn't make sense. But, it is what it is. I think we need to live within the financial constraints that we have today. I can't make those issues go away, not overnight. Is fixing Europe the priority when it comes to how the company will spend its cash? It is by far. It's the biggest drain on our resources both in terms of earnings and in terms of commitment going forward. So we need to get this issue under control. It cannot stay the way it is. It's unthinkable. Through nine months, Fiat lost 573 million euros in Europe, including 219 million in the third quarter. Do you still expect the full-year loss to be 700 million euros? Yes, the third-quarter numbers are the worst because of the summer plants shutdown. Fiat has offered to make cars for other automakers to better utilize its European plants. How are talks going to supply a minicar to Mazda? We're not even close. Let's get this issue nailed down on the Spider [which Mazda is supposed to build for Alfa Romeo in Japan]. Then we can discuss other projects. Anything I make is on the table. Your new plan for Alfa resembles those from 2006 and 2010. With Alfa's global sales on track to be at their lowest level since the late 1960s, why will this plan work while the others didn't? The 2010 plan for Alfa was ready, but the alliance with Chrysler was still in a complete state of immaturity. The level of implementation of that strategy is slightly different in 2012. Two years have gone by and a few billion dollars' worth of profits in between. I feel a lot more comfortable with the Chrysler of today than I did two years ago. Fiat without Chrysler would not be able to execute an Alfa plan. It's that simple. Volkswagen Group wants Alfa, but you say it is not for sale. Why do you want to keep the money losing brand? Simply because there are some things that are not for sale. If you went to [VW Chairman] Ferdinand Piech and you asked to buy Audi, he would tell you it's not for sale. He wouldn't be willing to discuss price. My argument is similar. I have zero interest in selling Alfa. Period. Will the production version of the 4C coupe debut at the Detroit show in January? How many units a year are planned? It won't be at the Detroit show. Production is limited by constraints we have from the new 1,750cc all–aluminum engine. Output won't be large. What is the current status of the Alfa Giulia, the mid-sized sedan that is supposed to replace the 159? It's in full development and will be built in Italy for global consumption. Will Alfa once again offer a large, rear-wheel-drive sedan, possibly something based on the new Maserati Ghibli? If there were to be a rear-drive Alfa, it undoubtedly would come from an architecture that is shared with Maserati. And it would be built together with Maserati in Turin. Would this new Alfa be big enough to become a chauffeur-driven car in China? How big would an Alfa SUV be? If there was one, it would be big enough. And built in Italy. Why do you see an extension of the 500 family, the Panda minicar and Freemont large minivan as complementary key models in the Fiat brand's turnaround plan in Europe? Despite being unrelated in their design, the market already sees the Freemont as an extension of the Panda flexibility concept in a much larger size. But if you focus on the 500 and Panda then Fiat only offers low-margin minicars and subcompacts in Europe. Aren't you lacking a compact model? No, you could do a compact that is 500 related. You've only got to be careful about style. There's a level of variation you can make with a particular style. We need to pay attention and be consistent. I'm not opposed to occupying the subcompact and compact segments with a 500-type car. Where does the 500X crossover fit in? It is fundamentally a large subcompact. Could we expect a larger 500 to eventually replace the Punto? I wouldn't worry about that. The Punto is in production, but I think ultimately the Fiat brand will end up being 500 or Panda based. Everything else is irrelevant. Will the price war in Europe force you to move production of the Punto replacement outside western Europe? The 500 range includes a cabrio, a crossover, the 500L small minivan and Abarth sporty models. What can we expect from the Panda family? The Panda is a brand within a brand, but it has limitations. It has almost no subcompact application, but it is a sort of Swiss army knife in minicars. It comes with the widest choice of powertrains, fuel types and traction options in its segment. It has dominated its segment in Europe. After a slow U.S. debut the Fiat 500's sales are rising fast. What changed? We put the right people in charge of the brand. So this was a personnel issue? By far, yes. The credibility of the 500 was established in 1957. We revived it in Europe in 2007. The car has always been a viable brand within a brand. Your new plan reduces the Lancia brand to the Ypsilon and an unnamed U.S.-made product due in 2015. Plus [additional] cars coming from the U.S. But your new four-year plan only mentions one imported model. It doesn't matter. If the business case is sound, there could be more. If built, could the Chrysler 100 hatchback become the new Lancia Delta in Europe? The 100 is a great way to provide dealers in the U.S. with two options in the compact segment [the other being the Dodge Dart sedan]. We've been encouraged by what we've seen happen with the Ford Focus. I think we're debunking a lot of the myths about hatchbacks not being sellable in the U.S. And the great thing about hatches is that they have applications outside the U.S. If the 100 gets produced, the answer [on whether it would be a viable addition for Lancia] is yes. Why are all of the Chryslers that have been rebadged as Lancias selling so poorly in Europe? Unless you're really premium, selling a large sedan in this market is tough, especially when your main European market is Italy. Could this failure be because people don't think of Lancia as a maker of mid-sized and large sedans? I don't know about the mid-sized segment, but certainly in the large segment, yes. Jeep is now Chrysler Group's No. 1 brand and is on track to beat your 800,000-unit by 2014 sales target. Could Jeep soon top 1 million sales a year? It needs to, but that will require a longer time frame. I don't even have that capacity right now. But the brand is capable. We appear to have done things right.